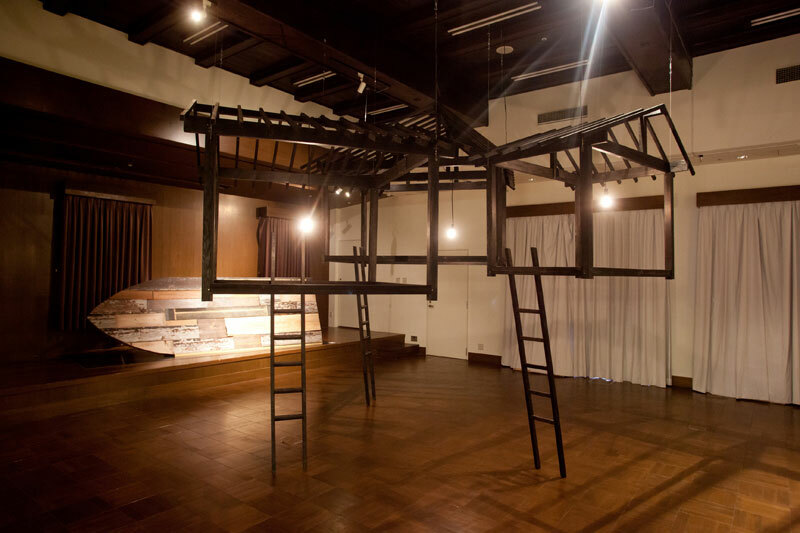 The structures are half scale of Japanese traditional room size such as 3, 4.5, 6 tatami-mats room. When viewer stands under the light, viewer will hear the Ishikawa folk tale “Nabetaro (the story about the unseeable otter helps old couple)” , the Ishikawa folk tale “Candy Buying Ghost (the story about the departed woman become ghost and go to buy candy for child she gave birth in burial)” and the agricultural ritual in Noto Ishikawa “Aenokoto (the story about landlord welcomes and treats the goddess of rice field)” , from each house. Viewers are desired to imagine the scenes of the story under the house. I believe that folktales or folk rituals are not just a old fiction story or absurdity, but those were more wisdom of old people to tell how people should understand or awe of Nature through narrating a story of the interaction with goddess, ghosts or friends that are imaginary existence in natural environment. However, those customs has been dismissed. The voices and structures attempt to present the absent existence that is common in 3 stories. In this work, I would like to re-examine the relationship between human and Nature in the economic and science-centered modern society.